Just returned late last night from my trip home for Christmas in Virginia. I had a wonderful time and enjoyed the 14 inches of snow. I made a fat snowman and ate enough to become one myself. I'm still trying to adjust to being back in South Beach and I'm making a list of all the things I need to do. Don't blame me for the cold weather because I didn't bring it back. Trust me. I gladly left the cold behind and I was looking forward to returning to tropical temperatures. I certainly wasn't ready for the cold weather that I woke up to this morning. Brrrr! 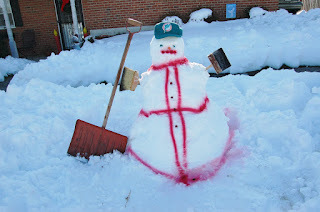 PHOTO: My snowman that I made back in Virginia.